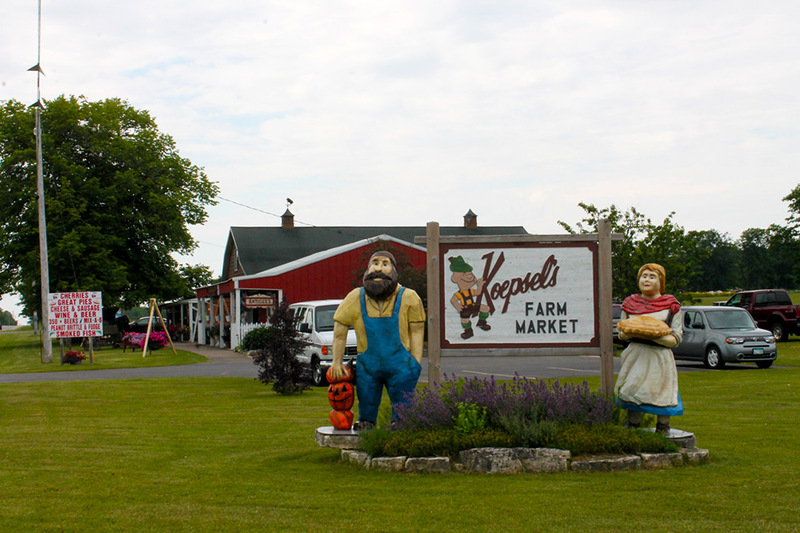 Koepsel’s Farm Market is easy to get to, just watch for the signs along Hwy 57 on your way up to Sister Bay and Northern Door County. Click here for directions & map. There is plenty of parking on both sides of the market. Our market has lots of space and is easy to walk through. Present owners Kevin and Karrie Oram work at the market every day along with their children Karina and Kami. 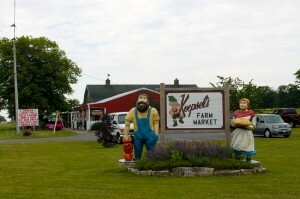 Karrie’s great great great grandfather Increase Claflin was the first white settler in Door County (circa 1835) and she is third generation Koepsel, carrying on the canning and baking practices set forth by her grandmother Emma and mother Mildred. Daughters Karina and Kami are now the fouth generation canners.Kevin’s Grandmother was born in Bailey’s Harbor in 1886 so both families go way back in Door County history. We have a great eye for antiques and have done a spectacular job at incorporating them throughout the market. We have several seed counters (antique display bins used in country stores of the past) with different varieties of canned goods and other goodies displayed on them. Wash bins, an old kitchen stove and other antique store counters are used throughout our store.Karrie’s brother Dennis has taken over the antique shop from thier parents and operates it along with his wife Melissa and daughter Bailey, he has a wonderful selection of antiques ready for your home. He is located in the building right next door to the market. We invite you to sample different items like dried cherries, jams, jellies,butters,mustards and Wisconsin cheese – we guarantee it will be some of the best you’ve ever had.